From 1921, asbestos was used throughout the Australian building industry. Its use became even more widespread during the post World War II building boom. The material was flexible, resistant to many elements (including heat and rot) and was cheap to manufacture. It was the perfect building material for a world rushing to develop after the stagnation of war. At the end of the war, Australia was a burgeoning economy, growing at a record rate and insatiable for asbestos. 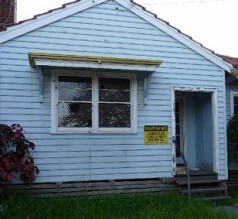 It is estimated that more than one million Australian homes were built using asbestos sheeting. Even more Australian homes contain asbestos in less obvious ways; in the eaves, in textured paint in the ceilings and walls, as an adhesive in wet areas (particularly under linoleum flooring) and as insulation for hot water systems. If your home was built before 1990 the chances are it contains asbestos in one of its many forms. Click here for a list of products likely to contain asbestos.